MUSHROOMS!!! Ok for giveaway #17 - here’s one of my favorite experiments i tried this year! 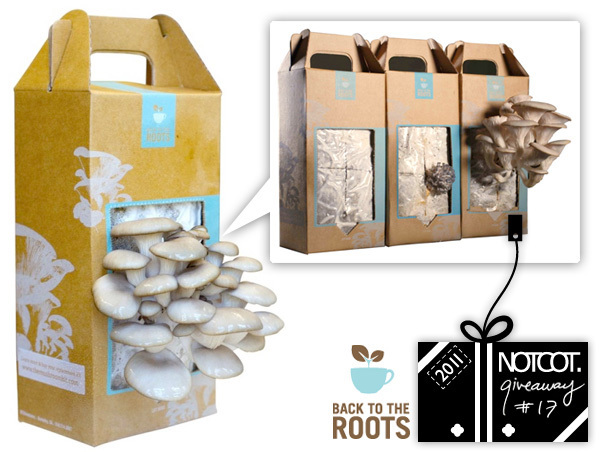 The Back to The Roots Grow Your Own Mushrooms Kit - lets your grow oyster mushrooms out of recycled coffee grounds! 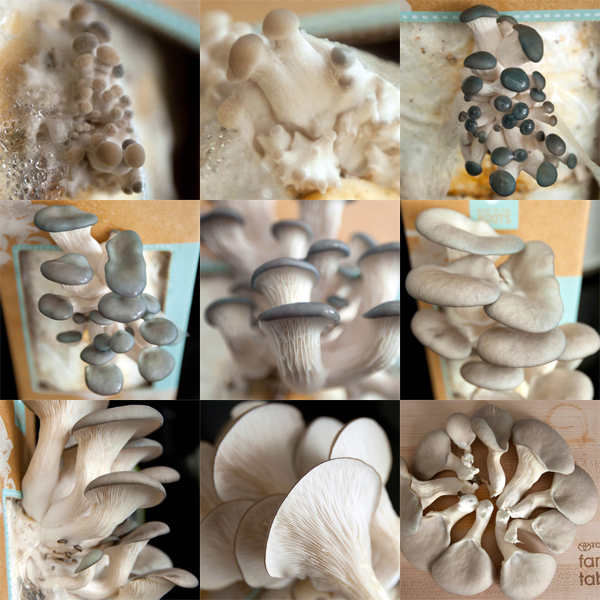 Take a look at my unboxing and the progression of my mushrooms over a few mere days! 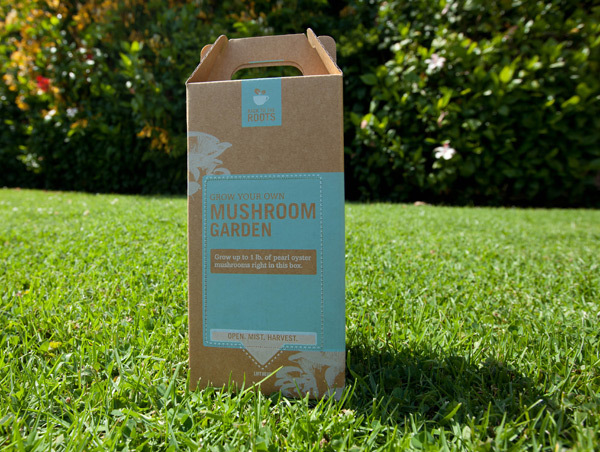 For a chance to win one of the 3 Grow Your Own Mushrooms Kit from Back To The Roots, leave a comment with what deliciousness you’re growing before midnight PST on Dec 16th, 2011 and we’ll notify the winners by email! Check out more pictures on the next page as well as a coupon! CONGRATS to our winners: Grant in New York, NY, Andrea in Portland, OR, and Nicole in Robbinsdale, MN! 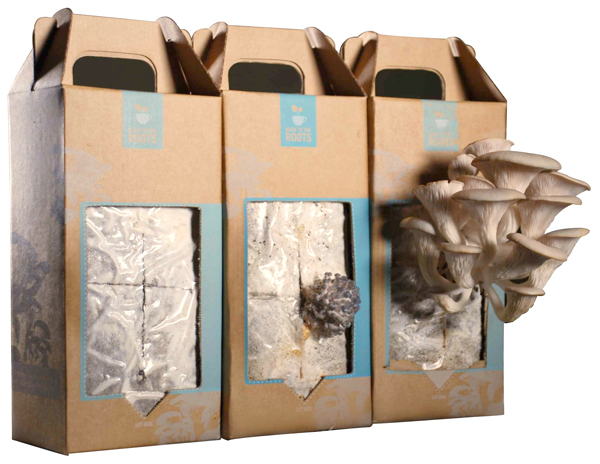 For a chance to win one of the 3 Grow Your Own Mushrooms Kit from Back To The Roots, leave a comment with what deliciousness you’re growing before midnight PST on Dec 16th, 2011 and we’ll notify the winners by email! I’m growing a lot of moss. I like moss. I like mushrooms too. Much better for eating. I have returned to school to pursue my dream and am thus growing myself intellectually, artistically through exploring new practices, and as a human being! I’m growing older, sitting on my porch, watching the fruit trees blossom with oranges, mangos, and bananas. I already have tarragon & thyme and rosemary. I’ll grow a pig to compliment the mushrooms, though. Currently I’ve got a little chive plant as well as some rosemary and sage, all in my kitchen window. I’m growing lots of house plants and starting some indoor herbs. Wish I lived some place warmer where I could grow my garden all year round. I’m growing blueberries and lemons. Just some aloe and prickly pear at the moment. Since my entire garden was destroyed by last weeks intense winds in La, i have nothing as of now :-( The mushroom would be a fun we to begin again! we tried mushrooms … but didn’t have success. I need to plant some chard and kale. we do tomatoes in the summertime. Only sprouts! It’s winter and freezing, I need to bring wildlife inside! 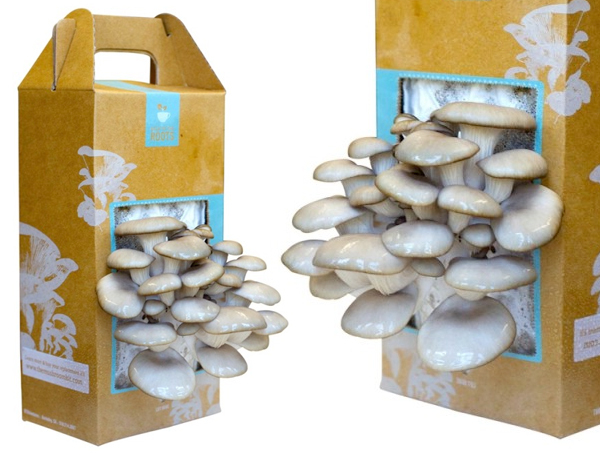 I’m growing shrooms for organic packaging (cushioning). My tomatoes, died, and my pepers tried to kill me. tomatos are my all time favorite! my waistline will be growing from all the deliciousness. Wanna grow up so i can grow mushrooms. I grow cherry tomatoes! They’re wonderful! I am growing a plant vine, waiting for some of those vine cuttings to root, a moss terrarium, and a bonsai tree! I’m growing basil, arugula, and strawberries in a Windowfarms unit in my window. I’m growing the potential to learn and experience from trying new things. I have a avocado tree I started from a seed this year. My garden thrived this summer and I’m already thinking what new and interesting things to try for next. Sadly none of the lettuce greens, tomato, pepper plants, dark leafy greens are wanting to grow for me indoors over the winter. Might just have to stick to sprouts and microgreens. I like growing basil plants! Basil tastes amazing on just about everything…also I have an orange tree in my backyard. At the moment I work on growing my self in grad school. But I use to have a beautiful garden full of herbs like Basil, Luiza and mint. I left it behind for know, trad it for school, but I will be back to my little garden. I’ve kept well away from homegrown anything since my wife and I made a disastrous batch of some kind of Hungarian (?) hangover cure called Nalewka Babuni, made with copious berries, vodka, and Vitamin C supplements. It was a mess, and it tasted like death. But designing the labels for our bottles sure was fun! rosemary and lavender. I use them in everything - pastas, breads, cookies, cocktails - so I figured I might as well cut out the middle man and just have them constantly on deck. Right now, I’m growing yeast in my sourdough starter, which has made some really tasty bread. And I just got some potting soil and will get some microgreens growing. Woohoo! I’m growing herbs!! for making pasta. We’re not growing anything outside at the moment with winter on its way. All the plants have been brought inside until spring, but we grow cucumbers, peppers, and tomatoes every year (to list only a few things). Since it is so cold out I have been doing things with terrariums, mainly using recycled glass bottles to grow different kinds of moss from the garden. 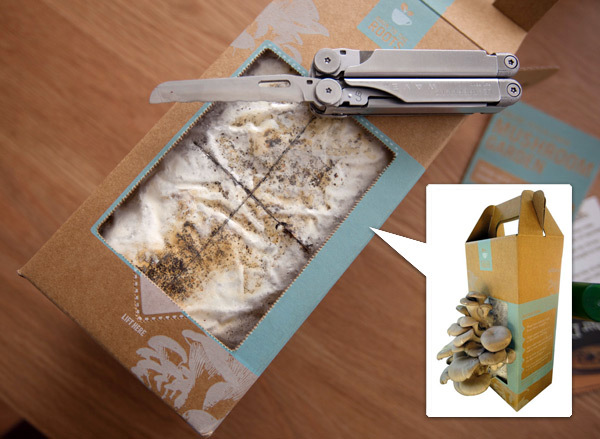 I would love to try my hand at growing mushrooms with one of these kits too! As of yet, I’m not growing anything. Wanna help fix that? If deliciousness can be defined as precious cuteness then I’m growing a child and he’s already been mushroom hunting with me in the lovely forests of Mt. Hood National Park. We hope to continue this tradition as he grows so he can learn about Morels, Chanterelles, Hedgehogs, Boletus, Angel Wings, Lobster, Cauliflower mushrooms and all the other edibles Oregon has to offer. 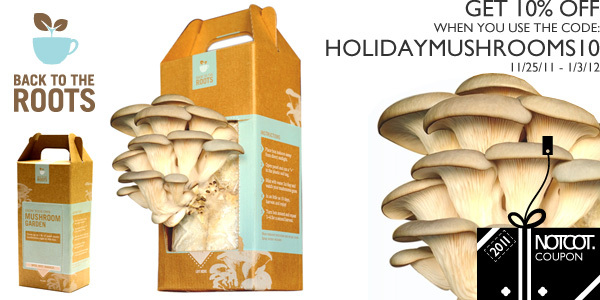 Growing some of our own could be the start of a whole new world of mushrooming! Since I live in Minnesota, all I can grow right now is a little herb garden with cilantro, rosemary, basil, parsley, and thyme!! We grow chili peppers. We eat it with every meal. There is nothing that can’t be enhanced with a little heat. Dessert included. I’m not growing any vegetables or fruit, but I am growing my very cute bonsai tree! I’m growing an orchid but I’m not sure how well it’s working. We are growing basil, rosemary, thyme, and some other herb that my wife has assured me is good for me. My wife is growing our first child to be due in March! my belly is growing. fatter. must grow mushrooms! I’m growing a batch of yeast in some pizza dough, and I’m growing some garlic in the garden (although it’s not growing all that fast just yet). That’s pretty much it at this time of year. Sadly I am not growing anything. Aside from the occasional mold in the bread cabinet. When I tried to do one of these a few months ago nothing happened. Not a teeny tiny thing. No mushrooms for me. They offered to replace it if I sent pictures, but I had thrown it away by then, so, no pictures either. I’m growing tomatoes, mint and basil!!! and also pretty flowers in my small garden!!! I’m growing the amount of almonds I’ve roasted, which I give as gifts in festively decorated glass jars. I’m growing worms in my worm bin! I’m growing figs, pears, blueberries, strawberries, tomatillos, tomatoes and pumpkins. And with your help, mushrooms! Hops to make beer, shiso leaves, wasabi root. Rosemary, sage, basil, cherry tomatoes, yellow pear tomatoes, chives, potatoes, carrots, leaks, acorn squash, runner beans, Cauliflower, Kale, and cabbage… our garden is a little out of control. I’m growing so much these days it is just astounding! I’m growing myself as a person through not only the last final stretch of my undergraduate education, but also through this amazing thing called LIFE! I’m helping people around me grow and discover as much as I possibly can. In the more literal sense I’m keeping my kombucha cultures growing along with my favorite little houseplant that I found almost dead one day. I had an affinity with this plant, I felt like the plant looked, so I vowed to save it. We’ve been best friends ever since and Sam and I are both alive and well today! Love love love!! It is too dark to grow anything at my house. Mushrooms would be perfect! it’s almost christmas and in my house there are all the plants which stay in the garden all the rest of the year! i’m growing myself with love, family and design. Right now we have a huge crop of satuma’s coming in which is leading to an abundance of satuma-bourbon marmalade, satuma-cello and right off the branch, juicy-deliciousness. On a much smaller scale, the grapefruit are just about ready to be picked. Oh yeah — brussel sprouts too. High rise apartments in the northern hemisphere don’t make for good food growing. I take my food scraps to the farmers market for composting and buy what the local farmers grow. I only grow non-food plants. The Basil froze. So for now just Kafir Lime and Meyer Lemon. Honestly, I’m not growing anything at the moment. But I would love to get this for my mom, who’s an avid gardener and teaches deaf and learning disabled students - I have a feeling this would be a fantastic class project for them! Oregano on my balcony, because it’s the only herb that’s had what it takes to survive the snow. Was gonna make a PB&J sandwich for breakfast…family of mold has moved into my bread bag…can’t decide whether to evict them or wait for the penicillins to illegally sublet. I’m growing a mango ‘tree’ as a house plant. Just grabbed a mango from the grocery store, ate it, and planted the seed. I’m growing bamboo. For what reason am I growing this I have no Idea. We just moved into a new home, so the only thing growing in our house is a poinsettia plant at this point. Nothing edible being grown right now, but love my bromeliad. I’m groing some sweet basil at the moment. I’m growing (besides the suspect mold invaders in the back of the fridge) a new respect for what my body is capable of - stronger every day! I am growing potatoes, mint, basil, parsley in my small apartment. I am going to add tomatoes to this mix. I would love to add mushrooms, also. Traditionally we grow all sorts of herbs, basil and tomatos, but you can only do so much on an apartment patio…. this would be a great addition!! I’m growing a cute little herb garden. Hopefully when things thaw I can expand it a bit. Thanks for the contest! I’m growing some holy basil, cilantro, and rosemary on my window sill alongside orchids, bonsai and some cacti. I am currently growing my ambition and hope for the coming new year. I typically don’t give into the whole new year, new you craziness, with the lead in of resolutions which will fade come February, but this year, I will be turning 30. I am growing myself, learning, taking classes and cooking more. So, cheers to personal growth. We grow potatoes - nothing better than chips from your own garden! when we found out we were going to have a baby, my husband started buying potted plants - 3 and 4 at a time. my house feels like a rain forest. I’m growing (or killing, depends on how you look at it) basil in a jar in the kitchen. I’m growing a kinmokusei (osmanthus fragrans). Inedible but it smells delicious, like apricots! I’ve never grown mushrooms… I’ve picked them, made tea with them, been mesmerized by them, i changed the lifes direction due to an experience eating them! I EVEN married a woman who collects mushrooms… COME ON, HOOK A BROTHER UP. im trying to grow an awesome ‘stache beard combo but… it just looks awkward. More oranges and lemons than I can keep up with! Also, bananas and papaya…ah Hawaii in December! Pineapple plant no fruit yet. We grow basil year-round on our kitchen window sill. I’m growing some ghost chilies right now. Still managing to grow scallions, dill and rosemary in the backyard. Gotta try some root vegetables too. The only thing available and learnt through hydroponics club in primary school for me is to grow red cute cherry tomatoes!! we’re trying to grow flowers in this cold, colorado winter! wish us luck! My growing need to finish finals and start my winter break! awwwesome! i was growing a delicious milk mo every morning of november to support the ‘movember’ movement.. time to move on to fungicember! Sadly, I am also growing fungus - though mine is between my toes. Oh how I wish for some in a box instead! I’m growing my mind, with science. I am growing a bunch of awesome succulents and cacti….. none-vege counts too right? :P Please let me win the mushroom kit..please! ^_* It looks amazing! We have a small herb garden outside our apartment. However, only a few of them are currently surviving the cold weather. I have one of those! I love it! Right now I’m trying to grow an avocadotree from the pit. So far, no progress. I’m growing mold somewhere in my house. Currently only growing 1 aloe plant and attempting to grow 1/2 a lawn that refuses to keep grass on it. Does a fake Christmas tree count? I’m currently growing a Ginseng plant. It is still rather young though but its shape is fantastic. Very human-like! I’m growing oregano,mint and rosemary to freshly season my cooking creations. We’re growing 13 acres of deliciousness to build a wildlife habitat. spearmint and pineapple mint for some very interesting mojitos! Herbs? Also growing a love for stand-up. I just put together a litte moss terrarium! I’m growing my daughter. she is turning one on the 22nd of this month. so far so good lol. Root veggies: turnips, beets, potatoes, radishes, carrots. I wish I had a green thumb. indoor plants dry out on me. we did grow tomato and cucumber and basil last summer. it’s so nice to be able to pick prickly vegetables, per meal. I’m planning on planting apple trees next spring. I will drink coffee for this. I’m growing some herbs but they’re not doing so well. I’m growing 5 tomatoes plants, 2 avocado trees, and 4 broccoli plants with 3 highly efficient compact fluorescent light bulbs and 1 sun. I’m a growin’ my new business, www.etsy.com/shop/SoundlessSoliloquy. Nothing right now but during the year, I love the tomatoes from my garden. I am very interested in fungi, they have intricate life cycles and reproductive processes far differing from our own. I have an unconventional garden. I grow herbs an vegetables in an urban setting in addition to growing yeast for the fermentatiion of alcohols and kombucha. I’m growing cayenne and pasilla bajio hot peppers and curry leaves in my apartment windowsills! I’m growing excited for my boyfriend to come home for the holidays. I just planted bulbs (Iris, Fresia, Lily) that my mom gave me in preparation for our back yard DIY wedding in July. I also just brought in our herbs (Thyme, Basil, Mint) from the garden so they don’t freeeeeeeeze. At the moment I am not growing anything because it is too dang cold in Oklahoma. Growing some yeast for no-knead bread. I’m growing herbs on my windowsill (basil and thyme, mostly), plus two little moss terrariums. I can’t seem to get my herbs to grow past the sprout phase but I think I could do wonders with some mushrooms! Strawberries… In the middle of New York winter??? what is this madness??? I grew my own saffron this year - just finished harvesting. The only thing I grow that’s edible is baby squash. So yummy !! I’m growing habanero peppers to ferment in smoked salt for delicious hot sauce! I’m growing orchids, named Leopold and Lucas. But they have proven to be not so delicious. Apparently humans like them for teh flowerz. We’re growing some basil on our window sill. During the summer my family grows small crops of tomatoes, swiss chard, onions, lettuce, zucchini, squash, and potatoes. Yum! Im growing a small christmas tree on the windowsill. It smells super nice! I’m growing all sorts of herbs! I am growing some snow peas right now. At the moment, I’m growing a Pachira plant and a Fiddle Fig tree. I’ve got a little herb garden going on! This mushroom kit would be a great addition. I’m growing black mold in my bathroom. I’m growing a kamquat tree..shrub?! for the new years! I’m growing a sourdough culture. And houseplants. I just planted tulips, dafodils and amarilis. Can’t wait for the spring, and even sooner for amarilis to bloom. my potted fern has teenie tiny mushrooms growing in the soil. The caps are about 5-10 mm in diameter, and makes me envision the tiniest fairies dancing around them. I’m growing a kombucha culture in my fridge. The list of things I should be doing around the house is growing. As is my wife’s ire! Our summer plantings are still hanging in there, despite the frost…strawberries, raspberries, and sweet peas. Wow, these look delicious. I’m growing some basil and rosemary on my windowsill at the moment and think both would go really nicely with some gently sauteed home-grown mushrooms, maybe with a dash of parmesan cheese, too. Yum! Hmmm not to much as it’s winter here and the garden looks dead. Oh no wait: I’m growing hungry. i’m growing some weird looking hairs on the back of my hand…. might wanna get that checked out..
I’m growing some Koji fungus with rice for a new batch of Sake. I’m growing a beard for Decembeard! I’ve been growing a sourdough starter in my fridge for 18 months. Delicious bread and pizza dough every week! I’m growing myself and my capacity to accept others more readily. I’m trying to grow paperwhite bulbs. I love their fragrant scent. I am growing herbs and greens indoors. I’m growing a tiny little boy. With two months to go until he sees the light of the world. Another branch on the tree of life has extended its arm to the future of man, bearing on the arms of the past; the most beautiful thing you can be part of growing. I’m growing some hot peppers!!! My windowsill has rosemary, lemongrass, and parsley sitll alive. I’m not sure if the oregano, chives, and sage will make it through the winter. The basil and cilantro didn’t even make it to winter. Nothing too exciting.. I usually grow some radishes some kale and some tomatoes. I’ll be growing lychee’s as soon as the weather permits! I love them, and they grow great in FL! Can’t wait to add mushrooms to my grow list! I’m growing tired, and I need a nap. I need mushrooms too! I am growing a huge rare set of cat thyme for my cats. Smells like ether but they turn into zombies for it. I’m growing an orchid plant that a friend gave me for my birthday. It’s wilting a little though… I’m not sure if orchids are meant to last through the winter. we have one bright cherry tomato on a completely dead looking tomato plant. it’s a chrismahanukwanzakuh miracle! I’m growing (really hot) chilli peppers in the house XD I’m amazed they still grow although it’s so freezing cold outside already lol. I’m growing a basil and a parsley plant on my windowsill, and would love to grow some mushrooms too! normally grow: tomatoes, peppers and some spices….would love to try this!! i am growing soooo many things. :) or am i seeing things. I’m growing myself with all the holiday chocolates and all while I should be eating healthy stuff like muchrooms.. :-) oh, And I’m also growing an ‘amaryllis’ in my window, it’s a great andere ver pretty flower! It grows centimeters a day! I am growing my own grocery store so that I can get lettuce and toilet paper whenever I want.